I joined the Hawaiian Trail and Mountain Club (HTMC) for a Saturday hike to Lua’alaea Falls deep in the back of lush green Manoa Valley. 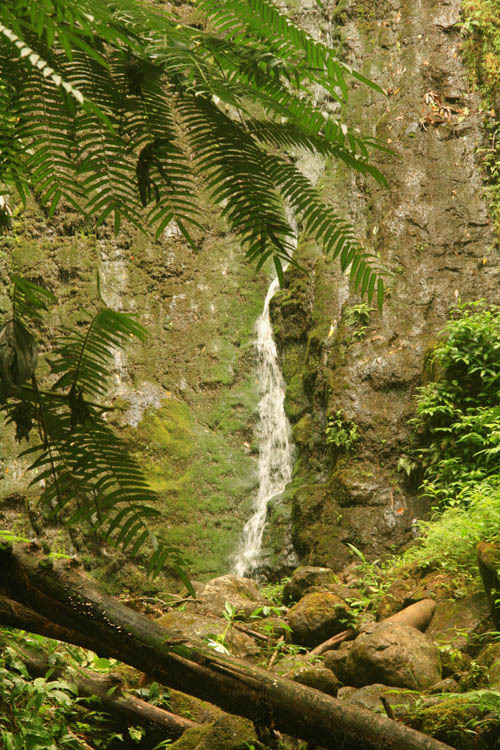 The hike to Lua’alaea Falls starts from the same trailhead as Manoa Falls which has become a heavily used site for ecotourism. 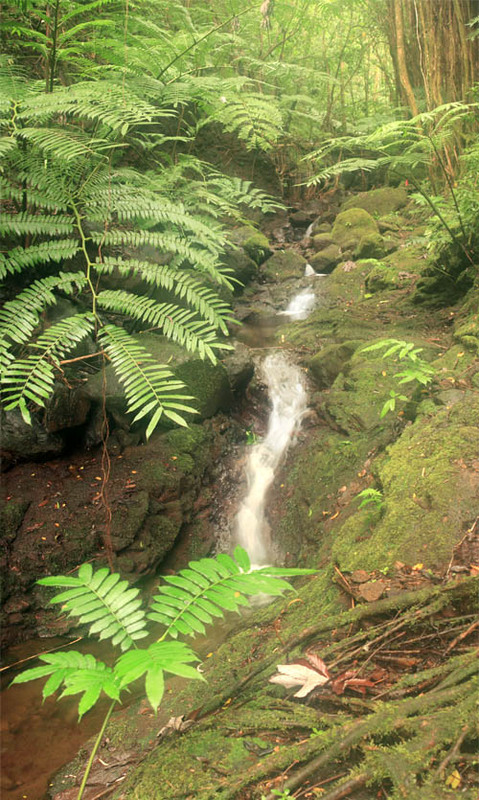 The trail to Lua’alaea Falls is much lesser traveled, wilder, and more interesting to traverse. 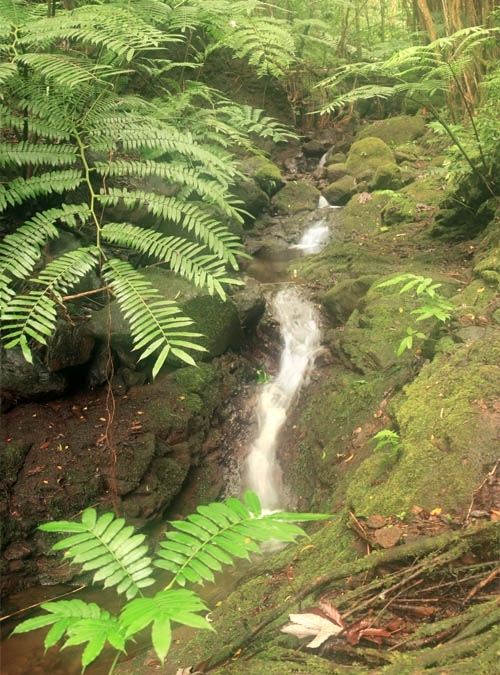 Once we crossed the bridge, we veered off the Manoa Falls trail into the stream to make our way to Luaalaea Falls. The hike is a short two miles through muddy jungle with slippery moss covered rocks and tree roots. Giant Mule’s Foot Ferns, with some fronds exceeding 12 feet long, dominate the trail and stream bed. 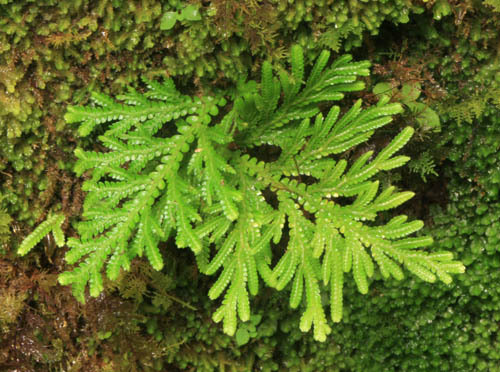 One of the few native plants we saw along the trail were lepelepe a moa or branched spike moss (salaginella) which grow on rocks covered with mosses and ferns. 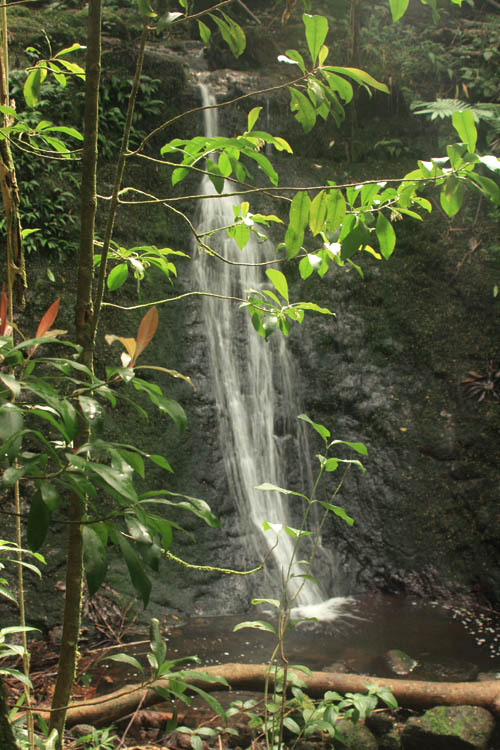 There are two parts of Lua’alaea Falls — a lower falls and an upper falls. The photo above was taken at the foot of the lower falls which is no more than 10 feet tall with a small pool at its base. 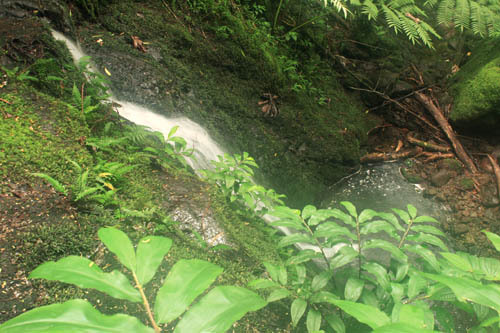 Awapuhi or shampoo ginger grows along the edge of lower Luaalaea Falls as it cascades into the pool at its base. As I made my way up the side of lower falls to reach the upper falls, I saw a cute little green and black tree frog that had toes as opposed to webbed feet. Known as the green and black poison dart frog (Dendrobates auratus), this small tree frog is no bigger than three-quarters on an inch long and is native to Central and South America. As their name implies, blow darts were rubbed on the back of frogs by indigenous tribes to make poison-tipped darts. These tree frogs were introduced to Manoa Valley in the 1950s to control mosquitoes. Upper Luaalaea Falls is much higher falling some 60 feet over a rock face. Since 2008 has been a dry year so far, the amount of water falling down the rock face was not impressive. Nonetheless, we enjoyed ourselves at the foot of Lua’alaea Falls and lingered for quite some time listening to the soothing sound of water falling into the charming pool at its base. Thanks Charlotte… I’ll make the correction. 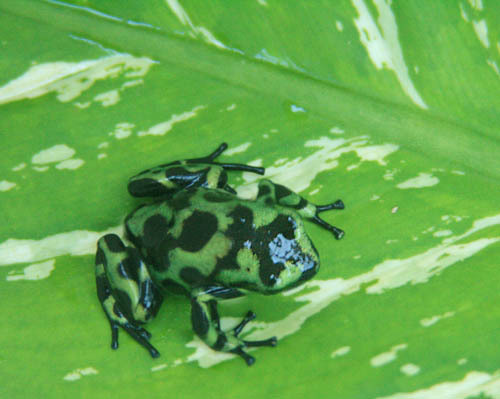 I saw the poison dart frog at the Lyon Arboretum about 10 years ago. Ray Baker was surprised — he thought they had died out since the introduction. I’m glad we now have photographic evidence. Hi Robert… I like poison dart frogs–they’re really cool little creatures. They can be in Manoa Valley next to the stream all the way to UH. I’ve also seen them on the windward side in Waiahole and Waikane Valleys. I saw one of those beautiful little frogs at my mother-in-laws garden in Waiahole Valley in Oct 2012, so I can verify that they have not died out. Cute little thing. We didn’t know if it was poisonous or not, but we let it alone just in case. I see the cute poison dart frogs in our jungly yard almost every day. Encountered a group of 4-5 under the house last week. They often sit on our front steps after a rain, hiding under ferns that overgrow the walkway. They’ve been in our yard for the 40 years we have lived in Manoa. I have never tried to handle them, however. I live close to Manoa Falls and have always had the poison dart frogs in my back yard. I also have a large ceramic pond with a water lily and found a two of them in it this am. I just hope my two small dogs don’t bite/eat them. They usually don’t come where the dogs are but because of the dry weather I think they’re coming close because of the pond.